Learn Brazilian Portuguese by following Helen, an American exchange student, as she goes to Recife, Brazil to study and live with a Brazilian family. Watch video and learn about greetings, shopping, food, dining out, weather, education, literature, holiday traditions, and more. With our specially designed video player for language learning you can pause the video at any point and scroll the transcription. Read annotations about culture and grammar. Click on almost any word or sentence to hear it spoken, along with translations. This course can be used either by independent learners or by students in a traditional or self-instructional classroom setting, and is the equivalent of the material covered in a one-year college course. The entire course contains 20 lessons, 9,000 audio clips, dozens of exercises, hundreds of annotations, and 39 videos performed by native speakers. 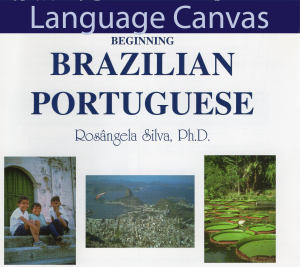 Beginning Brazilian Portuguese was developed and peer-reviewed by Portuguese language experts, and used by college students as their first year textbook. It was originally published as part of the highly reviewed University of Arizona Critical Languages Series, and we have added many new mobile-friendly features. Rosângela Souto Silva received an M.A. in Portuguese Linguistics and a Ph.D. in Applied Portuguese Linguistics with a certificate in SLATE (Second Language Acquisition and Teacher Education), both from the University of Illinois at Urbana-Champaign. Her professional experience includes Portuguese language instruction, Portuguese course development and supervision, and Portuguese Language Instruction Program directorship. She has developed, taught, and supervised Portuguese courses ranging from beginning to advanced levels for a variety of orientations, including Portuguese for speakers of Romance languages and Study Abroad Programs in Brazil. She has also published and presented conference papers on several areas of Second Language Acquisition (SLA), including cross-cultural pragmatics, bilingualism, language teaching and discourse analysis. Her website is here. Beginning Brazilian Portuguese materials © 1995-2019 Arizona Board Of Regents on behalf of the University Of Arizona. Used under license.